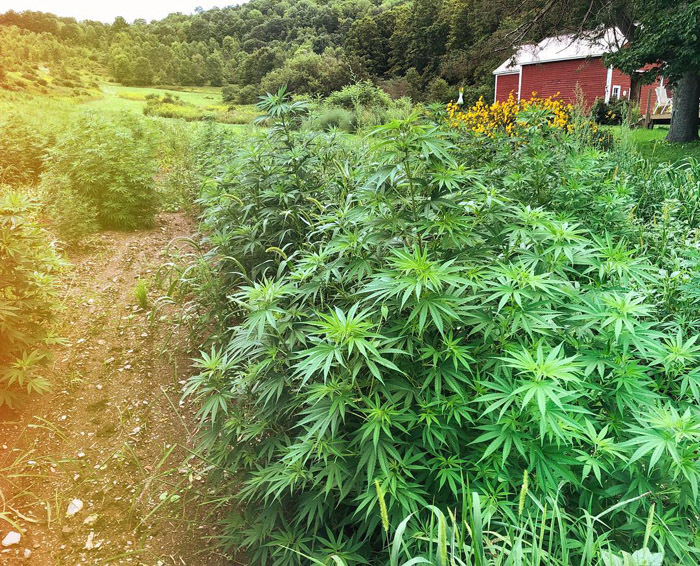 Home » Hot Copy » Could hemp save family farms in Washington County? Hemp is nearly exactly the same plant as marijuana, except it won’t get you high. By law it can contain no more than 0.3 percent THC, the psychoactive compound stoners crave and law enforcement chases. 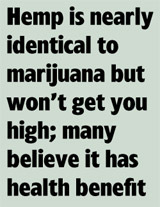 Meanwhile, hemp-derived cannabidiol, the non-psychoactive cannabis component commonly known as CBD, is all the rage. Entrepreneur.com pegs it as a $1 billion industry, with potential growth in sales to $22 billion by 2022. CBD is increasingly seen in the wellness community and even among some medical practitioners as a natural — though mostly so far only anecdotally validated — treatment for a host of ills, from chronic pain and inflammation to heart disease and even acne. It is sold in oils and salves, creams, foods, cosmetics, even dog treats. One drug — Epidiolex — has been tested and approved by the Food and Drug Administration for treating epileptic seizures. Hemp itself is used in a myriad of products from fiber, clothing and paper to rope and grain. Two things happened in December to advance hemp’s prospects. The December 2018 federal Farm Bill differentiated hemp from marijuana. It went from a Schedule 1 restricted substance overseen by the Drug Enforcement Administration to an agricultural commodity eligible for such support as crop insurance, just like any other farm product. Also, New York State cleared the path for many more farmers to grow hemp by exponentially increasing the number of available hemp permits from a previous handful of “research” allowances. New York State says on its Website that it aims “to capitalize on the budding industrial hemp market,” pun maybe intended. Medical marijuana is already a reality, albeit largely restricted, and Governor Andrew Cuomo said in his State of the State that he aims to fast-track legalization of recreational marijuana as well — though he said Monday it is unlikely the details will be worked out quickly enough to include legalization in this year’s budget. What’s it mean for Washington County farmers? “I can hardly believe it,” says Mr. Jacobs, who with his wife Martha Johnson has run Slack Hollow Farm in Argyle for nearly 30 years, concentrating on year-round market greens, garlic and other staples. Mr. Jacobs received the $500 hemp cultivation permit this winter and said he has seed, growing plans, processing relationships and even direct-market outlets already in place. He plans to market CBD products directly under the Slack Hollow label, starting with CBD oils. He said that one of his accounts that currently sells Slack Hollow food products predicts CBD could generate sales of one-and-a-half times his farm’s entire previous yearly income. He said both their young adult sons are “hot to trot” on the new venture, and that hemp/CBD products may provide enough capital and cash flow to make it possible for them to continue farming as a career. Iris said it’s an effort to revitalize the family’s eighth-generation dairy farm. Founded in 1787, it had been dormant since their grandfather gave up the operation in the late 1960s, well before the sisters, ages 25 and 30, were even born. Hemp growing wasn’t easy going, Iris tells The Chronicle. “It was the hardest year of our lives.” But even with numerous pitfalls — and still not yet having earned a dime on their product — Iris deems it “a big success” and said they’re eager to expand their efforts this year. She said there’s also the unspoken truth that a lot of farmers are already quite versed in under-the-radar cultivation of cannabis — and that experience will be put to good use in a legal environment. He said, “We like to caution farmers. The industry is still at the ground floor.” But he adds, “New York State is poised to be a leader in cannabis in general. New York is very well suited for a lot of craft products and crops, as we have seen with grapes and hops, with close access to markets in New York City and the Hudson Valley. This season, CSG plans to work with about 20 farms across the state, providing everything from THC-compliant starter plants and seeds that also maximize CBD content, and offering help with staying up-to-date on changing regulations, brand-building, and brokering deals with processors and producers. He said there are five planned hemp farms in Washington County. Several will be growing as partner sites under Castetter’s own license, including Gardenworks at MacClan Farm in Salem, and R.S. Taylor and Sons, the farm-brewery in Hebron. Rich Taylor at R.S. Taylor said they are specifically growing hemp to include it as an ingredient in their craft beers. He said hemp is in the same family as hops, and provides a unique flavor to beer.